Good credit control is essential to any business but for many small and medium sized companies it is not cost effective to have their own credit controller. The task of credit control can fall to another member of staff within the business or even to the business owners. Using an outsourced credit control and invoice collections service can be a very cost effective way of handling the sales ledger of a company. We can put you in touch with outsourcers that provide a first class credit control service. We have researched customer satisfaction within this sector so that you can benefit from knowing who provides the best collections service. You can get a quote by using the "Request A Quote" box on the right of this page. Many of the factoring companies that are on our panel, provide a great outsourced credit control service to their customers, even if their customer has no need to borrow any funds from them (known as Service Only Factoring). The invoice collections service can be provided on a stand alone basis. The good thing is that factoring companies have experienced, specialist staff to provide such a service. It can even be provided in respect of overseas customers, if required. 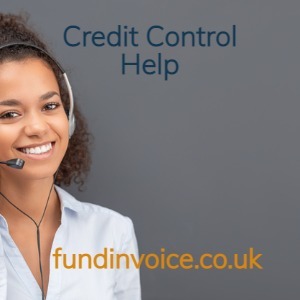 You can also use a specialist credit control agency who have both the manpower and language skills to handles large ledgers and oversears debtors. Company turning over £900,000 (including VAT) per annum. 50 live debtors (customers with outstanding invoices on the sales ledger). 1,000 invoices raised per annum. In the above example, the cost of providing a full, outsourced credit control service is currently about 0.75% of turnover. In this example that would be an annual cost of £6,750 + VAT. Bad Debt Protection (also known as "non recourse") can protect a company against bad debts if a customer fails to pay, providing they trade within an agreed credit limit for the customer. For the example business above, the cost of adding bad debt protection would be approximately, an additional 0.35% of turnover. In this example, that would be an additional £3,150 + VAT per annum, for the bad debt protection. At the time of writing this, according to payscale.com, the median cost of employing a credit controller in the UK was £19,806 (the salary range for credit controllers being £15,320 to £27,518). That is a huge additional cost over an above the outsourced pricing mentioned above. In addition, by employing a credit controller the business would have to consider additional costs for employers national insurance contributions, telephone rental and calls, statement production and chasing letters, not to mention office accommodation and other benefits that may be due to a member of staff. All of these costs are normally included in the cost of an outsourced service. There is also the issue of whether or not the business really needs a full time credit controller. If you are considering undertaking you own credit control read our free guide.